What do you do when your favorite teacher bloggers decide to host a book study? You immediately download the book and prepare to link up! 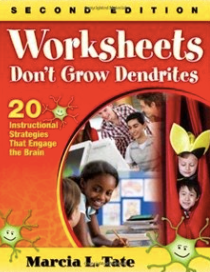 Starting on February 28th we will be reading Worksheets Don’t Grow Dendrites by Marcia L. Tate. Now, while I wouldn’t exactly say that I have a ton of free time to be reading for pleasure, these ladies seem to be pretty excited and inspired about this book and they are certain to be just about as busy as me. Cara Carroll over at The First Grade Parade explains the book study in this post. I can’t wait to read, blog and link up about my learning!